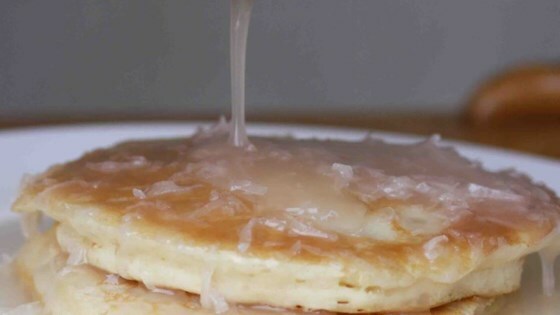 "I searched everywhere for a coconut syrup recipe like I enjoyed while I was in Hawaii. When every recipe I tried failed to satisfy me, I was compelled to create my own." Whisk together the coconut milk and cornstarch in a saucepan until the cornstarch is dissolved. Pour in the corn syrup, sugar, and coconut; bring to a boil, stirring continually. As soon as the mixture comes to a rolling boil, remove from heat. Allow to cool completely before serving. Its still not as good as the syrup in Hawaii. My husband and I were very disappointed. I'll try it again though using fresh coconut because we think the sugared coconut is what ruins this recipe. This stuff was delicious!!! Whatever you do don't get any on your forehead....your tongue will beat your brains out trying to get to it!!! This is a good, fresh tasting syrup, but delicate. I only used 1 Tbsp cornstarch, and that thickened it fine. Delicious! Makes a TON though, I'd recommend halving or even quartering the recipe.